Source and contact talented software developers & boost response rates with Looped. Webfolio Connect - IT recruitment, reinvented! Find the perfect hire from our growing database of developers and import your existing candidates to include in your search. We fetch extra relevant information allowing you to view a developer's recent tweets, Github repositories and job history all in one place. 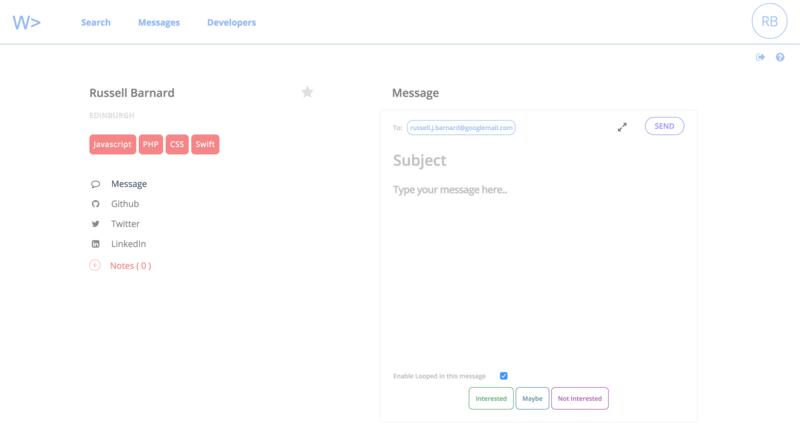 We’re super excited to introduce Looped, our revolutionary new messaging feature which aims to increase response rates and save time with one-click replies! Filter your search by location and programming language. You can also save searches for handiness! Get the most out of our features by inviting your team members. Add notes on a candidate’s profile, mention team members and track their activity. Say goodbye to chasing false leads with our quick and easy way to see who is interested and who is not! We charge £99/month plus £30/month for each additional team member. No minimum term and cancel any time. Sign up today and get 3 months free, happy days!